Mr. Manfred Kanther has graciously made his very fine Excel spreadsheet available for download by RF Cafe visitors. It is written in the Excel 2000 environment, so any version from 2000 up through Excel 2007 will support it. Click the screen image to the right to download the ZIP file. For a final release version of Matching Network Designer, please visit Mr. Kanther's website. If you did not know better, you would believe that this is actually a stand-alone application, and not a spreadsheet. All of the coding appears to be implemented in the VBA. Depending on the level of macro security you have set in Excel, you might have to click the Enable Macro button as the spreadsheet loads. "All yellow shaded fields are allowed for input data. The impact of component changes in placement and value can be directly explored on the chart and therefore be trimmed for perfect matching conditions. R's, C's, L's and T's (transmission line) can be configured. The worksheet can be duplicated so that you can work on different matching networks in parallel." Mr. Kanther's e-mail is shown in the spreadsheet. Please be sure to thank him for making this available to you! Let me demonstrate with the attached workbook, dedicated to TI/Chipcon's CC1100 output matching network, how capable the tool is ( or Excel ). 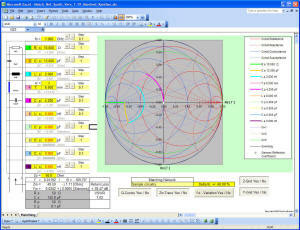 Three worksheets are networked together to form the proposed matching network for the CC1100 at the frequency of 915MHz. To analyse this network with the tool, three sheets are necessary. The first sheet represents half a Balun Bridge for the N-Output, named "Matching RF-Nout" The second sheet represents half a Balun Bridge for the P-Output, named "Matching RF-Pout" The third sheet "Antenna matching" combines the the Rp, Cp of the overall "Matching RF-Nout" circuit and Rp, LP of the overall "Matching RF-Pout" circuit plus the few components on the way to the antenna. 1. The output impedance of the CC1100 ports is given in the datasheet by looking towards the antenna. In the sheets we are looking to the CC1100 outputs hence the conjugate complex of the given impedance must be used. 2. The capacitor of C121 of 1pF needs to be doubled in value if you connect them to ground on both Balun branches instead between of the branches. 3. The Rp, Cp and the Rp, Lp values in the third sheet "Antenna matching" are links backward to the respective sheets of "Matching RF-Nout" and "Matching RF-Pout". Don't overwrite it. 4. The frequency value of the sheets "Matching RF-Nout" and "Matching RF-Pout" is linked forward to the "Antenna matching" frequency input field. All the links make it possible to change the components values and the overall impact can be observed in the "Antenna matching" sheet. Also the frequency variation of the whole circuit can be shown if you click on the "fo-Variation Yes/No" button on the "Antenna matching" sheet. ( It will take about 10+ seconds to calculate and display the curve ) But don't do that on the other both sheets, it will destroy the links of the frequency input and you need to establish them again ( that is no problem but you need to be aware of it ).